Muffin Tin Monday again! Theme this time is green. 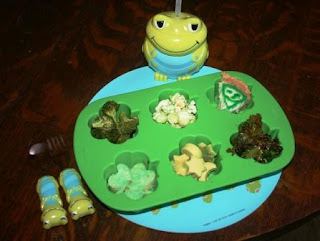 We had roasted broccoli, key lime popcorn, key lime pie (with smiley face in triangle - in case you couldn't tell from the pic), roasted clover shaped tofu (in a tamari/sesame seed marinade with a touch of green food coloring), avocado moons and stars, and kale chips. 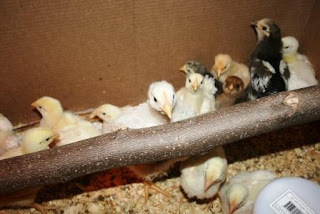 All the chicks continue to do well. We have divided them into two big boxes, and are now on the lookout for another big box. They certainly grow fast! Last week, Elvis went sailing. 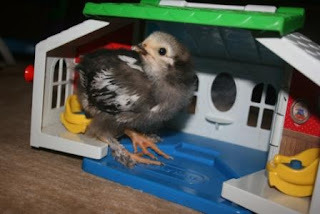 We have 2 lemony sherbert colored layers and they are the most calm chicks of the bunch. This one tested out my great, great grandmother's candy dish. Do you think she'd be horrified? I don't know. She had a farm, so maybe not. 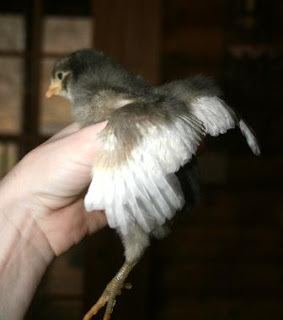 Note that this chick has feathery legs like Horace! Love it! Speaking of Horace, he's made himself at home. They like to stick together in their home. Warmth? Companionship? Or just to have someone else to pick on? What great foods! I love you healthy meal. I love your tin and all your green foods! Yum! Nice, healthy tin. 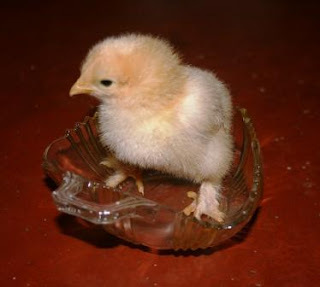 Those chicks are too cute. I must know more about key lime popcorn. We had some awesome flavored popcorns at Tokyo Disney but I've never seen anything like it here. I Love your tin! Too Cute! Giggly Girls, I got the key lime popcorn on Valentine's Day clearance at Target for 19 cents! I've been saving it for something special. It came with a tattoo also, LOL! the keylime popcorn sounds good. did you make it? and how. How did you make that keylime popcorn? Great tin! I love the idea of Key lime popcorn, I found this recipe online. Very creative. i really like the sound of key lime popcorn too. and the kale chips sound interesting too. I'd never heard of key lime popcorn either... was it good? Too bad I missed that Target clearance!